Pakistan will be judged not by words but on basis of the action it takes to dismantle terror infrastructure on its soil, India said Saturday, asserting that its non-military strike on the JeM terrorist training camp in Balakot achieved its desired objective. External Affairs Ministry Spokesperson Raveesh Kumar said if Pakistan claims to be a 'naya Pakistan' (New Pakistan) with a 'nayi soch' (new thinking), then it should demonstrate 'naya' action (new action) against terror groups operating with impunity from its soil. The MEA's comments came a day after Pakistan Prime Minister Imran Khan said he will not allow Pakistani soil to be used for terror directed at other countries. Khan has been saying that a 'Naya Pakistan' is embarking on a new journey under his leadership. Kumar said Pakistan has been making identical statements after separate terror attacks and now Islamabad will have to take up the concrete action the international community expected it to take and must rein in terror groups operating from its soil. "We remain resolute in our determination to persuade the international community of the necessity of compelling Pakistan to move beyond mere words and to show credible, verifiable and sustained actions. We have and we will continue to act with responsibility and maturity," he said at a media briefing. Kumar said the widespread presence of terrorist camps in Pakistan is public knowledge and repeated requests by India and the international community for Pakistan to take action against such groups has been met with "denial". "In 2004, the then President of Pakistan had made a solemn public commitment that they would not allow any territory under their control to be used for terrorist activity in any manner," he said. "But till today, however, Pakistan has failed to take any credible action against Jaish-e-Mohammed and other terrorist organisations, which continue to operate with impunity from Pakistan," he said, adding Pakistan will be judged not by its words but on the basis of action it takes to dismantle terror infrastructure. Tension between the two nuclear-armed neighbours escalated after the February 14 Pulwama terror attack and subsequent aerial strike by India on a training camp of the Jaish-e-Mohammed (JeM) in Balakot on February 26. "Our non-military counter terrorism strike of February 26 achieved the intended objective. It has demonstrated our firm resolve to take decisive action against cross-border terrorism," Kumar said about Balakot strike. He, however, evaded questions on number of casualties in the strike. Kumar said the fact that Pakistan refused access to journalists from visiting the site of the strike in Balakot meant that they have "plenty to hide". "So the initial bravado that everything is open please come and visit has disappeared. We are absolutely confident that strikes on Balakot has been successful and achieved the desired objectives," he asserted. On Pakistan's retaliatory strike, he said instead of taking action against terrorist groups on its soil, Islamabad chose to escalate through an "act of aggression" by violating Indian airspace and attempting, unsuccessfully, to target military facilities. Kumar also accused Pakistan of propagating a "false narrative" of the events of the day when Pakistani jets unsuccessfully attempted to target Indian military installations. In the aerial combat India had lost a Mig-21 Bison aircraft and its pilot Wing Commander Abhinandan Varthaman was captured by Pakistan. Pakistan claimed it downed two Indian jets, and rejected IAF's assertion that a F-16 aircraft was shot down by it during the dogfight. "Only one aircraft was lost by us. If, as Pakistan claims, they have a video recording of the downing of a second Indian aircraft, why have they not shown it to the international media even after more than one week? "Questions should be asked to them as to where the fuselage of the aircraft is and what has happened to the pilots? As we have already said, there are eyewitness accounts and electronic evidence that Pakistan deployed F-16 aircraft and that one F-16 was shot down by Wing Commander Abhinandan," Kumar said. He said Pakistan should explain why it continues to deny that its F-16 aircraft has been shot down. "We have asked the United States to also examine whether the use of F16 against India is in accordance with the terms and conditions of sale," he added. Kumar said India's armed forces continue to maintain strict vigil and will remain determined in the defence of the nation and its citizens. Hitting out at Pakistan for remaining in a state of denial, he said, "It is regrettable that Pakistan still continues to deny Jaish-e-Mohammed's own claim of taking ownership of the Pulwama attack." 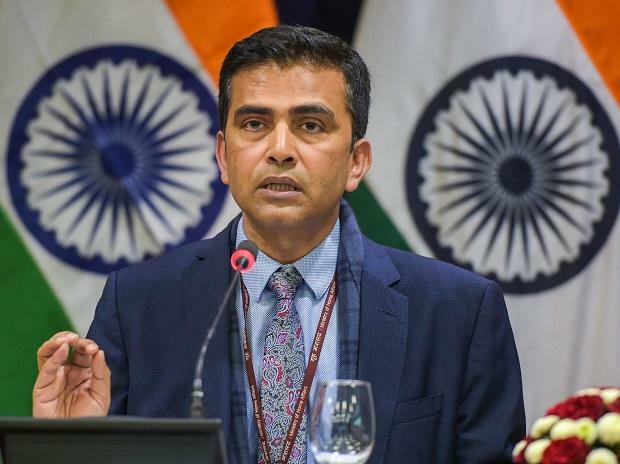 The MEA spokesperson referred to the Pakistan foreign minister's interview to BBC on March where he talked about "some confusion" about JeM's claim on the Pulwama attack. "Is Pakistan defending the Jaish-e-Mohammed and acting as its spokesperson? Does Pakistan's claim have any credibility," Kumar asked. He said despite the media interviews by Pakistan's foreign minister and former president Musharraf acknowledging the presence of JeM in Pakistan, the spokesperson of the Pakistan armed forces openly denied the presence of the terror group in the country.